I was stoked to be invited to be part of the A Blog Named Hero's 5th Anniversary Blog Hop. I am a current Facebook Design Team member for A Blog Named Hero. This card was made at a recent Craft Retreat using the Hero Arts Layering Flamingo stampset. After inking the images, I masked a line and used distress inks to create the background. To get the soft effect, I used Clarity brushes to add the inks. I love the smooth and soft effect! Thanks for dropping by! There are heaps of prizes if you comment on this blog hop. The next one on the list is Tenia Nelson. The entire blog hop list can be found here. Love your color choices and that flamingo is a fav! Pretty! You are so right this card is fabulous. I love the flamingo,so pretty. That's gorgeous! I love the colors you used and the little bit of sparkle is perfect. Like the soft effects you achieved on this card. 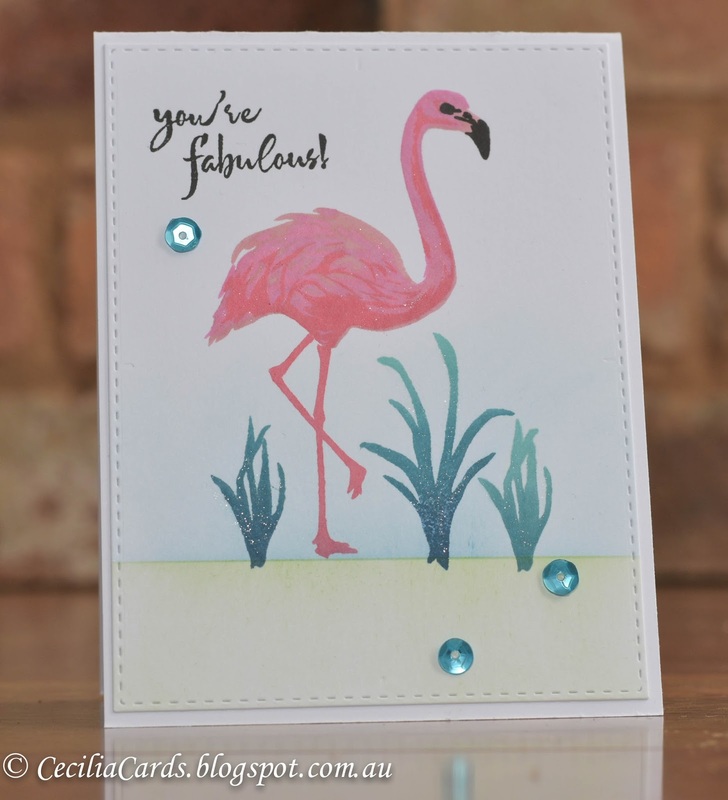 It creates such a lovely card and is the perfect touch for highlighting this flamingo image. Thanks for sharing it. Your card would be perfect for my friend that loves flamingos! So cute. Love the sparkle on your flamingo! Cute card! Oh how lovely Cecilia, a wonderful card! I don't know what it is about flamingo's but they always look so cute on cards and they make me think of summer! Love it! Love that flamingo, and your layering is perfect! Great card! I love the soft blended look you got with the Clarity brushes. Thank you! I just purchased these brushes, and now I will have to go and get me some "creative" time asap, as this card inspired me to have some fun. Flamingo's can do that you know...? hahahahaha tfs your talent today. So crazy cute!!!!!! This is another set on my wish list. Had a flamingo stamp years ago but it is not in my stash anymore. Now I need a new one! Just love Flamingo's! The brushes add such a soft look to the background! Great card! Layering stamps make for really, beautiful images! Love that layered flamingo! Pretty card and a fun one. You have totally captured the feeling of Florida! Thanks - it is not sunny, not warm, and nothing as bright as your flamingo is outside my window. This card is so cute and fun. Thanks for sharing. Flamingos are such a popular image/.Love the card! And this card is fabulous! ! I love the soft colors in this card. Flamingos! How fun. I can't wait for summer! Love this! I don't need this flamingo, but I sure do want it. 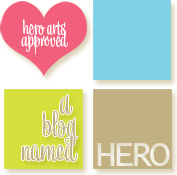 :) Thanks for helping us celebrate at A Blog Named Hero! Love it. And Happy Blogaversary Hero! Your card is so adorable! I love flamingos! I saw one in Florida and they are so beautiful. Beautifully simple and everything just works together. Fun card! Love that flamingo!! Thanks for sharing on this great blog hop. Makes me long for the beach. Love your CAS design! Love those layering sets! I have this stamp and love it! Great card. I have this set and have made many cards with it. Yours is lovely. Oh this is so cute!!! LOVE that flamingo. Great design!! So pretty! The colors are perfect! This is such a great blog hop with so much talent and inspiration! Thanks for sharing yours! Happy Anniversary Hero Arts! How lovely!! Beautiful color combination, and I love that subtle shimmer! Love how you did the background. That flamingo stamp is a classic. Simple and perfect. You don't need to dress up this card with further elements. It stands on its own. The colors for the flamingo are so soft and lovely. After watching another blogger talk about how challenging it is to do the legs, I think stamping the legs pink is the best way to go!!!! How I love Hero's layering stamps! You've put this one together beautifully. I have this stamp set but haven't used it. Thank you for the great inspiration, love the soft background! ADORABLE! I have a son & DIL who love flamingos! Love the touch of sparkle you added! A very pretty CAS card, love your flamingo! Very pretty! Lovely color choices and sparkle! This card makes me want to go to Florida..
Great card. The layering looks amazing. I love stamp layering it just doesn't like me :( but I do keep trying. Thanks for sharing your beautiful card. I love this stamp set. That Flamingo stamp set has been on my wish list for some time. Your card is beautiful and has given me inspiration! Fabulous card Cecilia, lovely colors and design. Layered cards are such fun. Takes a little to get the technique down but worth it. Lovely card. The flamingo looks great. Love these colors together! Such a pretty card. EEEK! I love pink flamingos. This is so soft looking yet fabulous. Thanks for sharing in this awesome hop. What a fun card using a flamingo. I have a couple of friends who would just love this card! Love your beautiful card! Hero Arts layering stamp sets are wonderful! The flamingo set is one of my favorites, but still on my wish list! Great card! That flamingo is definitely fabulous! Like the scene you created with wonderfully layered stamping & coloring of the Flamingo. I love the layered flamingo, and your color choice (pinks & teals) are perfect! Love that flamingo -- summer here we come! Cute card, I'm partial to flamingos. The sparkle makes it extra special! Love the flamingo too, so cute! Great card. What a wonderful card! Your flamingo is just perfect and a great way to celebrate this wonderful milestone! I have this set. Going to give it a try. Thanks! Such a cute fun card. I love the flamingo stamp!!! Perfect! What a great card, layering stamps are so much fun. Soft color background just makes the flamingo stand out. Cool idea. Love how you did the flamingo. Hero Arts has some of the best layering stamp sets! Great card!!! You are fabulous! I love the cute flamingo. Thanks for the idea of how to use my Flamingo stamp that has been just sitting and waiting for some good inspiration. The flamingo stamp is one of my favs! Love the colours and just the right amount of bling. Ok. That is a pretty card. Love the flamingo. Great card. This is a beautiful card. The flamingo is so pretty. Fabulous card! I love everything about it. I love this flamingo, great card! The soft colors really add to the beauty of this card. super pretty, love that big Flamingo! Love your card! This layering stamp is awesome! Love your flamingo. I had to have this also! Great color laying. Love your card and your colors were wonderful. Your card is great!! I love layering stamp sets, the provide so much depth to the images. 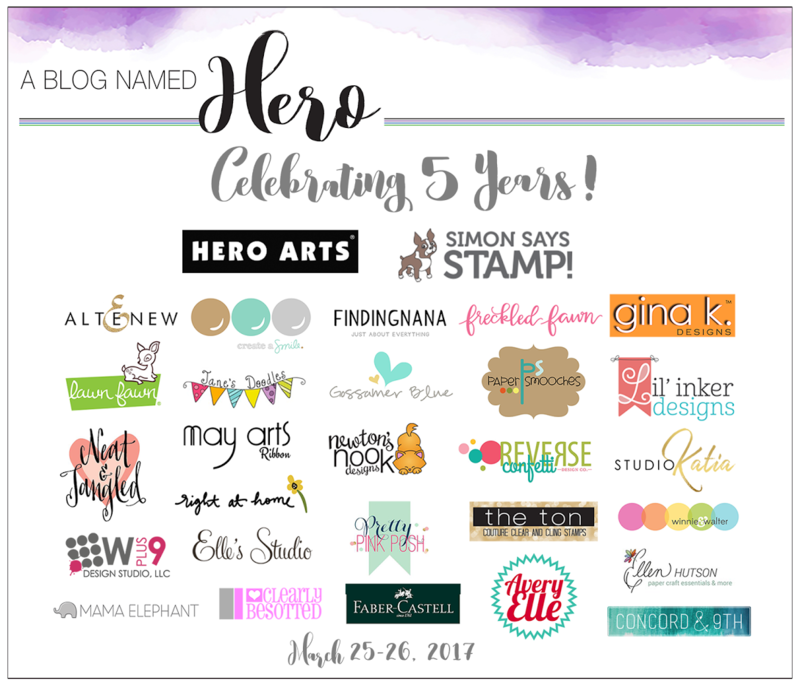 This is a very inspirational blog hop showing a diverse array of stamps and dies from so many companies. Super cute card. Being from Florida I love this great flamingo card. Glad to see you along the hop. Your card is so pretty, I love the touches of glitter. Fantastic colors, looks so real. Beautiful colours on this flamingo card. Wow, great job! That flamngo is cool! Technology is so wonderful for stampers - we get to see so many new ideas ad beautiful cards like this. Gotta love it. Thanks for sharing your card! I really like this card! Love the flamingo! I've loved this pink flamingo since it came out! Truly fabulous card! Love the layering on this card. The flamingo has so many fun uses. Thank you for sharing it with us! Oh to be on a warm beach with flamingos!! Beautiful!! Your card is fabulous. Who doesn't love a pink flamingo. Great card, those layered stamps are really fantastic! Hero Arts makes great stamps so I can make great cards! You nailed the colors on this card! Fabulous card! I love the shimmer on the images! Super fun card, thank you for sharing! Flamingos are my favorite. Makes me want summer to get here! Have a sunny day! I love this flamingo! Very cute card. That flamingo is to die for! Enjoying the cards on this wonderful hop! I have this stamp and I feel a CASE coming on! So beautiful. You sure got a wonderful soft look with the Clarity brushes! Amazing. Love this flamingo card. Makes me think of summer on this cold wet damp spring morning. I love this flamingo stamp set so I was so excited to see it in this pretty card! Loved the soft blending and the colors - thanks for sharing! Love the pink flamingo!!! Simple cards are great! I just love flamingos. This card is perfect. What a great card. The sequins just add the finishing touch. Beautiful colors on this card, and I love the bit of shimmer too! Delightful card. Great choice of colors. Aww so pretty! I love the sequins that add such a pretty touch that brings everything together. Fun, flirty and fabulous!!! That's what that flamingo is!!! Now you've inspired me to pull mine out and play! Your flamingo has beautiful shading. I love tropical looking cards because I live in southwest Florida! Great job! The colors are just stunning!